What Do the ICF Coaching Credentials Mean? Understanding coaching credentials is critical to making the right choice, whether you are a coach or you are hiring a coach. When I started out in my own coach education almost a decade ago, I was amazed at the depth of the field and how much there was to learn. I didn’t know how much I didn’t know! Not long after that, I did know what I didn’t know (gulp), but that’s a longer story I will save for another day. Many years, much training and a few thousand coaching hours later I can happily say I’ve got the hang of things. In the spirit of collegiality, I’m writing a few posts that will fast-track your knowledge on some of the fundamentals. In my last post, I wrote a quick primer on the common terms used to compare coach qualifications. In this post, I’ll share a high-level overview of the International Coach Federation coaching credentials and what they mean. So, hang on tight, here is your sixty-second lesson on ICF coaching credentials! There are three levels of coach credentials that are available through the International Coach Federation. They differ in two significant ways: hours of coach related training and hours of client coaching experience. At this level, applicants will have completed a full coach training program that is designated as an ICF Accredited Coach Training Program (ACTP) or at least 60 hours of coach-specific training from another coaching program. The client coaching experience required at the ACC level is 100 hours with at least eight different coachees. At this level, applicants will have completed a full coach training program that is designated as an ICF Accredited Coach Training Program (ACTP) or at least 125 hours of coach-specific training from another coaching program. The client coaching experience required at the PCC level is 500 hours with at least 25 clients following the start of coach-specific training. At this level, applicants will have completed at least 200 hours of coach-specific training from an ICF Accredited Coach Training program or another coaching program. The client coaching experience required at the MCC level is 2,500 hours with at least 35 different coaching clients. 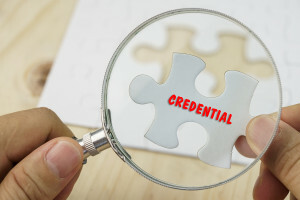 You will find in-depth information and resources on these levels of the ICF credentials on the ICF website, as well as very specific information on the requirements and application process for each credential. I encourage you to use the ICF website as your primary and official source of up-to-date information and criteria for credentialing. You can download a comparison chart here. No matter where you are in the search for the right coach, or the right path in your own coach education, having a solid understanding of all of the variables will assist you in making the best choice for you. I hope this mini-lesson has helped. If you are a coach working toward your ICF credentials, go grab this resource for keeping your records straight (and who couldn’t use that) Free Easy Tracking Form for Coaches. Do it now, you’ll be glad you did! If you are coach looking for a quick way to understand and integrate the ICF Coach Core Competencies, take a look at my book series The Really Competent Coach. It will get you up to speed. Fast! Did you find this post helpful? Please take a minute to post a comment in the box below. You are welcome to post your questions there too! I’ll get back to you pronto!